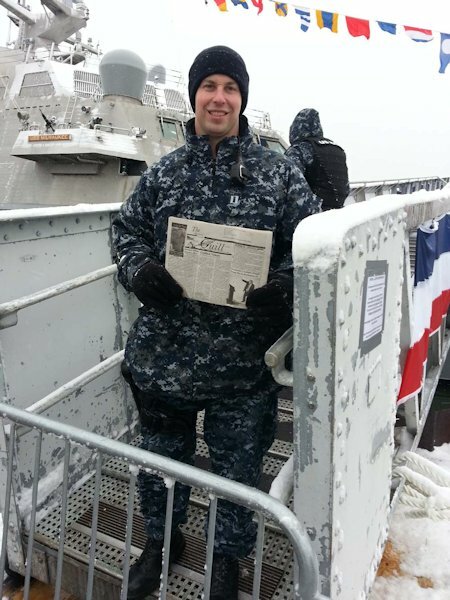 On a frigid day in the middle of a snowstorm in Milwaukee on November 21st the newest Naval warship, the USS MILWAUKEE (LCS 5) was commissioned. LT John Buss is a member of the commissioning crew and took a minute from his duties to pose with "The Quill". John's wife Meghan and son, George flew out from San Diego, CA, to attend the historic occasion. Also attending the commissioning were Dale and Donna Buss, Lynn Buss and her friend, Hubert, Uncles Dan and Andy Buss, Aunt Theresa, and Hannah Brueck! The USS Milwaukee and crew are now headed to Florida via the Great Lakes and St. Lawrence Seaway. John plans to be back with his family in San Diego in time for Christmas. When you go on a trip, take "The Quill" along and have your picture taken with it, and send it to us. Let's see where all the Quill can travel.